So the calling to be instruments of peace, rather than division and discord is of paramount importance. When we allow God’s Spirit to work in us in such a way to bring about peace we’re reflecting Jesus and what He came to do. When we don’t allow God’s Spirit to work in us we’re working against what Jesus accomplished; this isn’t a small matter. That being said, Sande in his book The Peace Maker – A Biblical Guide To Resolving Personal Conflict speaks of three basic ways people respond to conflict and the various ways those responses are expressed. The first is escape responses. This involves a person who is more interested in ignoring the problem rather than resolving it. With an escape response you have denial, flight, and the most serious of all, suicide. The second is attack responses. An attack response involves a “person who is more interested in winning conflict than in preserving a relationship” (pp. 24). Too many times, this has characterized my approach to resolving conflict. Attack responses are assault, litigation and again the most serious of all, murder. 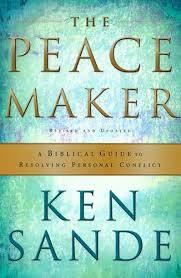 Peacemaking responses are the third way in which people respond to personal conflict. This involve “responses commanded by God, empowered by the gospel, and directed toward finding just and mutually agreeable solutions to conflict” (pp. 25). The ways in which peacemaking responses are seen are in overlooking an offense, negotiation, mediation, arbitration, and accountability. Sande provides a helpful summary when he speaks to the difference in focus that characterize each response. He states, “when I resort to an escape response, I am generally focusing on ‘me.’ I am looking for what is easy, convenient, or non-threatening for myself. When I use an attack response, I am generally focusing on ‘you,’ blaming you and expecting you to give in and solve the problem. When I use a peacemaking response, my focus is on ‘us.’ I am aware of everyone’s interests in the dispute, especially God’s, and I am working toward mutual responsibility in solving a problem” (28). Each of those questions are tough ones and what’s even tougher is pursuing peace, particularly when everything in us seems to scream vindication, vengeance, they deserve it, they got what was coming to them, I’m not at fault, etc., etc., etc. Pursuing a biblical approach to resolving conflict points us to Christ who accomplished peace Himself and likewise enables us by the work of the Spirit to do the seemingly impossible…establish peace.